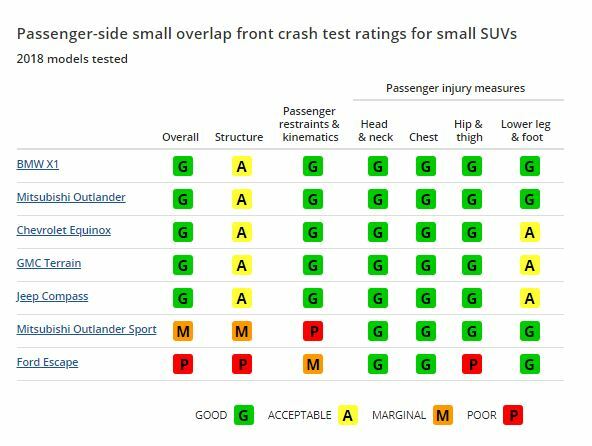 Insurance Institute for Highway Safety testing has revealed that even “good” small SUV performers in a new passenger-side small-overlap test had only an “acceptable” structure. This combined with “poor” and “marginal” overall scores for a 2018 Ford Escape and 2018 Mitsubishi Outlander Sport, respectively, could lead to mid-generation tweaks in body design for some of the six models tested — and subsequently alter collision repair procedures as well. Without a “good” or “acceptable” passenger-side small-overlap score, a vehicle can’t win the IIHS’ top Top Safety Pick+ honor this year. The IIHS expanded the test, which rams the left or right 25 percent of the vehicle’s front end into a barrier at 40 mph, after discovering that some OEMs were protecting the driver to pass the driver’s-side IIHS test but ignoring the unaudited passenger side. The IIHS reported Wednesday that the Escape had been one such vehicle. 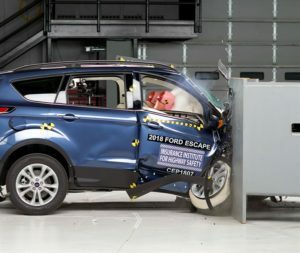 “Starting with 2017 models, Ford reinforced the structure on the driver side of the Escape to improve occupant protection in a small overlap front crash but didn’t make the same change to the passenger side,” the IIHS wrote. Therefore, repairers who worked on the 2013-16 Ford Escape — one of America’s most popular vehicles, selling 308,296 last year — were encountering a different structure with the 2017 model year of otherwise the same design generation. “Beginning with 2017 models, the driver door hinge pillar was reinforced and the front-end structure was modified to improve occupant protection in small overlap frontal crashes,” the IIHS wrote. We don’t know if this small redesign led to a change in Ford repair procedures, but the example should still reinforce the importance of rechecking OEM repair procedures online with each individual vehicle — something subtle might have changed. It’ll be interesting to see if the importance of the Escape to Ford’s sales leads the OEM to introduce a similar change for the 2019 model year given the Escape’s dismal performance on the new passenger-side test compared with competitors. Of course, the OEM might just gut out the bad mark until the next-generation Escape (which will appear next year, presumably for the 2020 model year). 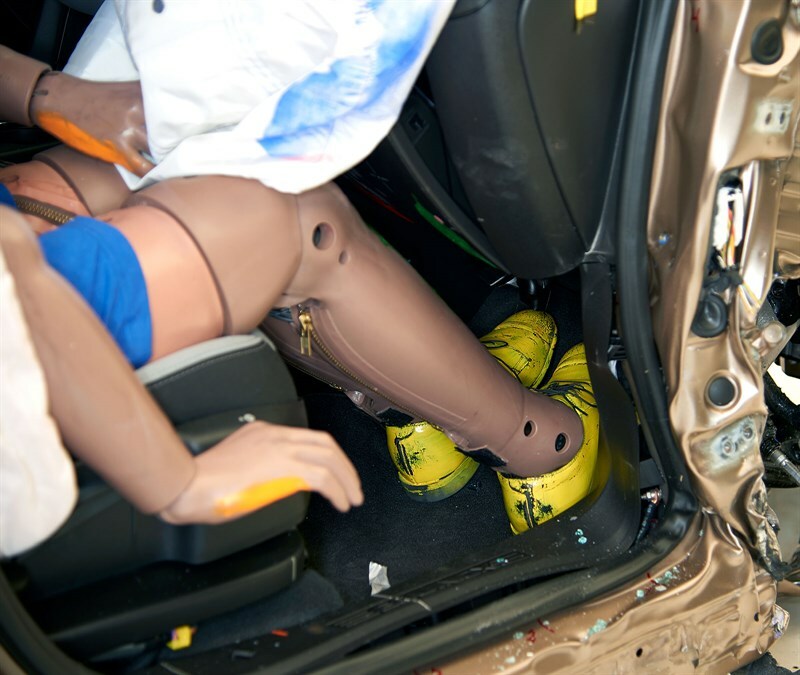 The dummy would likely have been injured in the right hip, according to the IIHS. 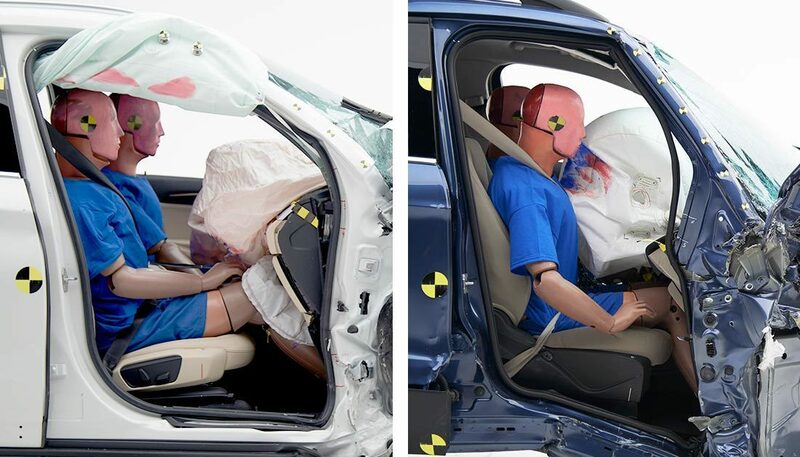 Perhaps worse, the passenger’s side airbag didn’t even deploy in the Escape and the Outlander Sport. However, the normal 2018 Mitsubishi Outlander ironically joined the 2018 BMW X1 in performing the best on the test, scoring “good” overall and across all metrics except for their “acceptable” structures. The 2018 Chevrolet Equinox — which lost so much weight the IIHS now calls it a small SUV — GMC Terrain and Jeep Compass all earned “goods” overall despite “acceptable” structures and passenger lower leg and foot protection. It’ll be interesting to see if Chevrolet re-engineers the Equinox to address these points given the SUV’s importance (GM sold 290,458 in 2017) and years to go before the next design generation. The same could happen with the GMC Terrain, which is only a year into this generation, and the Jeep Compass, which became “all-new” with the 2017 model year. Such crash testing and OEM responses to it demonstrate the need to constantly research OEM vehicle structures and procedures for possible mid-generation and even mid-year revamps. But the testing also reinforces how seemingly similar vehicles — these are all small SUVs — might have subtle differences that affect crash performance. Researching individual manufacturer instructions rather than attempting to blindly apply lessons from one model to another will be crucial to preserving that crashworthiness. Finally, if OEM designers can’t always pass such crash tests, how well do you think repairs to their bodies guesstimated by a tech without any formal physics, engineering or metallurgy training are going to fare in real-world crashes? Following automaker repair procedures is the only possible choice, and even if some factory body-in-white apparently could stand a redesign, at least adhering to OEM repair procedures is guaranteed not to make anything worse.